Corruption scandals, elections, a controversial winter World Cup, the destination of the 2026 World Cup and pushing through some major reforms - new Fifa president Gianni Infantino must have a bulging in-tray on his new shiny desk in Zurich. But the 45-year-old still had his priorities straight by spending his first day in charge playing seven-a-side with a host of sporting legends. 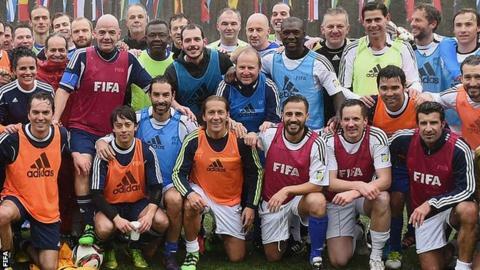 Infantino, who told the BBC last week that overhauling the structure and running of Fifa must be "implemented from day one, immediately" spent a rainy afternoon lining up alongside Luis Figo, Demetrio Albertini, Zvonimir Boban, Fabio Cannavaro, Paulo Maldini, Deco, Fernando Hierro, Robert Pires, Clarence Seedorf, Andriy Shevchenko and Kelly Smith, among others. The Swiss made himself captain of one side - donning the number nine shirt - as former England manager Fabio Capello coached from the sidelines. "As of today, I'd like that when we speak about Fifa, we speak about football," Infantino said. "That's why I arranged these games." Infantino also confirmed that he had no idea how much he will be paid in his new role yet, saying: "I have not discussed with anyone what my pay, or not pay, will be. "It is not for money that I was candidate to become Fifa president."